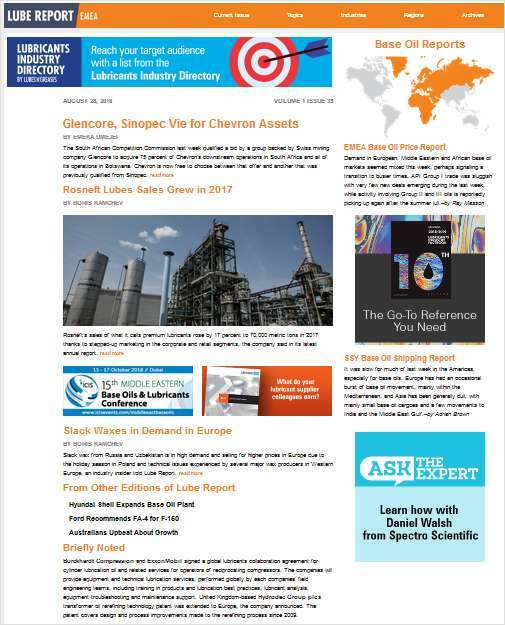 Free Subscription: "Lube Report EMEA"
Launched in January of 2018, Lube Report EMEA is a free weekly e-newsletter covering the lubricant industry in Europe, the Middle East and Africa. By submitting this content request, I have legitimate interest in the content and agree that LNG Publishing Company, Inc., their partners, and the creators of any other content I have selected may contact me regarding news, products, and services that may be of interest to me. Do you wish to receive a FREE subscription to Lube Report EMEA? Because you are submitting this form electronically, our circulation auditors require us to ask you an auditable, identifying question in order to start or renew your subscription(s). First letter of the town where you were born. Complete and verifiable information is required in order to receive this subscription. • Geographic Eligibility: Worldwide. • The publisher determines qualification and reserves the right to limit the number of free subscriptions.